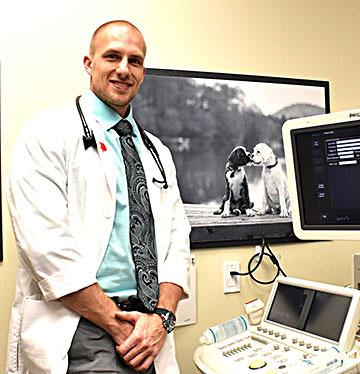 Dr. Daniel Newhard, a cardiology resident at the college, is heading a clinical drug trial in the Cardiology Service at the Wilford and Kate Bailey Small Animal Teaching Hospital. Pet owners can begin registering to participate in the two-year study that costs nothing but a $75 screening and examination fee. Entresto, a highly effective drug used in treating human heart patients, is being evaluated at Auburn University’s College of Veterinary Medicine for use with dogs. A clinical trial for the drug is underway in the Cardiology Service at the Wilford and Kate Bailey Small Animal Teaching Hospital. Pet owners can begin registering to participate in the two-year study that costs nothing but a $75 screening and examination fee, says Dr. Daniel Newhard, a cardiology resident at the college and chief physician conducting the trial. Although the entire trial is a two-year program, each dog participates for only 30 days, he notes. The U.S. Food & Drug Administration (FDA) granted approval for the use of Entresto in human medicine in 2015. The drug now is the standard of care for patients with Myxomatous Mitral Valve Disease (MMVD), Dr. Newhard said. MMVD is a common heart illness among dogs and can lead to congestive heart failure, Dr. Newhard says. This study will compare Entresto and a placebo in dogs with MMVD. Planning for the clinical trials has been underway for about two years. Dog patients are presently being enrolled for the study. Plans are to complete the clinical trial over a two-year span. “That will enable us to compile and analyze very through data,” Dr. Newhard said. – Dogs cannot be previously diagnosed with congestive heart failure. Participants also must be brought in for all scheduled re-checks during their participation in the trial, and pet owners will be responsible for collecting urine samples at home on the morning of each scheduled re-check visit and bringing it with their pet. Dogs participating in the trial receive an untrasound, chest X-rays and bloodwork, Dr. Newhard adds. “All of this is at no cost to the pet owner, beyond the initial $75 screening and examination fee,” Dr. Newhard said. Patients can be referred for participation in this clinical trial by their primary veterinarian, or, pet owners may contact Dr. Newhard directly by phone or email. “The heart ultrasound is free; chest X-rays are free; the medication is free; and the results of this trial will help us to better understand and treat dogs with MMVD,” Dr. Newhard said. To inquire or to register for participation in this clinical trial, call 334.844.4690, or contact Dr. Newhard by email at dkn0004@auburn.edu. Other co-investigators working with Dr. Newhard in this study include Dr. Seung Woo Jung, assistant professor of cardiology, and Dr. Randolph Winter, assistant professor of cardiology, both in the Department of Clinical Sciences.